Congrates to Ben Tufts in our Gracie Jiu-jitsu training program at the martial arts zone. 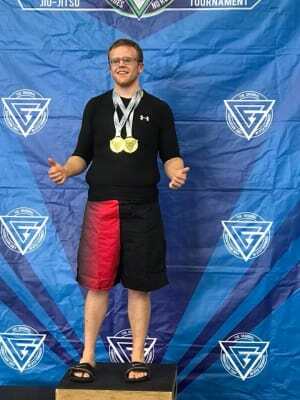 1st place win double gold at the good fight tournament last Saturday June 16, 2018. Ben has been training hard in our Gracie Jiu-jitsu class at the martial arts zone for over 1 year now. We are proud of his dedication and hard work. Ben is becoming a really good example and representation of Gracie Jiu-jitsu in Manchester, NH! Keep up the great work Ben!